NEW YORK--(BUSINESS WIRE)-- Macy’s (NYSE:M) will celebrate National Believe Day on Friday, Dec. 7 by doubling donations to Make-A-Wish® for each letter to Santa collected that day in stores or online at macys.com/believe. As part of the 11th annual Believe campaign, Macy’s will also mark this special day with the return of Wishes Across America, helping grant 25 special wishes for children across the country. 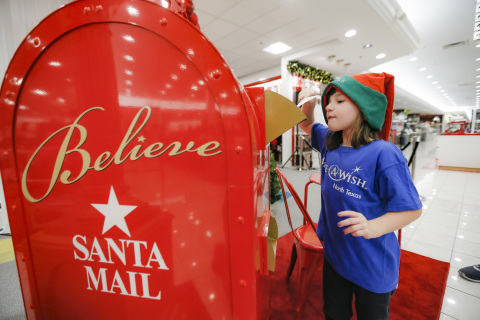 The beloved Believe program helps bring joy to children with critical illnesses and this year, from Nov. 2 to Dec. 24, Macy’s has pledged to donate $1 to Make-A-Wish for each letter sent, up to $1 million. For National Believe Day, Macy’s will pledge an additional $1 per letter, up to an extra $1 million, above the existing $1 million campaign goal. To generate even more excitement in stores on National Believe Day and as part of Macy’s 12 Days of Friends and Family activities, kids will be able to create winter works of art featuring Sunny the Snowpal at coloring stations located next to the Believe letterboxes and snap a photo at the Macy’s selfie wall. Additionally, as an extra special treat for National Believe Day this year, the one and only Santa will be taking over Macy’s Twitter @macys to spread the message of love and generosity! Tweet with Mr. Claus and join in the fun on Dec. 7 using #macysbelieve. You can also check out Macy’s Instagram stories (@macys) to follow the excitement of National Believe Day including Wishes Across America, letter writing, double donations, and more. Macy’s has also teamed up with Giphy to create one-of-a-kind Macy’s Santa GIFs for fans to use across all social media platforms. These custom jolly GIFs allow everyone to continue spreading Christmas wonder all season long and can be found by simply searching “Santa” wherever GIFs are used across Facebook, Instagram Stories, Twitter, Messenger, and more. The Believe campaign was inspired by the story of an 8-year-old girl, Virginia Hanlon, who wrote a letter to the New York Sun newspaper in 1897. Virginia asked the paper’s editor, Francis P. Church, if there really was a Santa Claus. “Yes, Virginia, there is a Santa Claus,” Church replied. “He exists as certainly as love and generosity and devotion exist." This iconic response illustrates the spirit of the Believe campaign, as well as the climactic National Believe Day. To learn more about Macy's Believe campaign, visit macys.com/believe. For additional media materials, including images and b-roll, visit http://pimsmultimedia.com/MacysHoliday2018/believe.php. Macy's, the largest retail brand of Macy's, Inc., delivers fashion and affordable luxury to customers at approximately 650 locations in 44 states, the District of Columbia, Puerto Rico and Guam, as well as to customers in the U.S. and more than 100 international destinations through its leading online store at macys.com. Via its stores, e-commerce site, mobile and social platforms, Macy's offers distinctive assortments including the most desired family of exclusive and fashion brands for him, her and home. Macy's is known for such epic events as Macy's 4th of July Fireworks® and the Macy's Thanksgiving Day Parade®, as well as spectacular fashion shows, culinary events, flower shows and celebrity appearances. Macy's flagship stores -- including Herald Square in New York City, Union Square in San Francisco, State Street in Chicago, Dadeland in Miami and South Coast Plaza in southern California -- are known internationally and are leading destinations for visitors. Building on a more than 150-year tradition, and with the collective support of customers and employees, Macy's helps strengthen communities by supporting local and national charities giving more than $52 million each year, plus 153,000 hours of volunteer service, to help make a difference in the lives of our customers.